If you'd like to make a contribution to the campaign, print, and fill out the portion of THIS FORM that applies to you. The top section is for individuals, the lower for associations, committees, etc. Feel free to stop by at any time (no contribution necessary) to sign up for our email updates, to volunteer your time, and to pick up a bumper sticker. 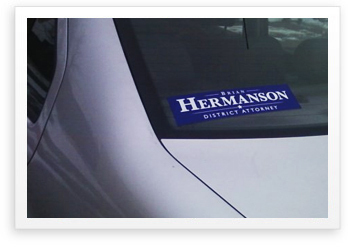 "I've called Brian Hermanson a client and a friend for almost 10 years. Brian puts in a full day at the office and adds caring for 39 quarter horses to his busy schedule. I've seen Brian Hermanson out of the suit and tie and in Carhartt and a sweat soaked Newkirk Livestock hat. I know he'll be a great District Attorney because he will roll up his sleeves and do the honest work we need to get things done."